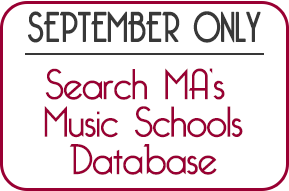 The editors have selected top schools from the 1,223 educational institutions in our database of music schools. To add to our existing information, we asked each of our picks for additional details, such as: audition requirements, post-graduate assistance programs, number of full time and adjunct faculty and number of scholarships awarded. 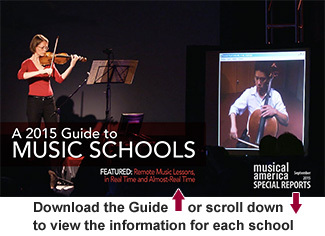 We've also included a special feature story, Remote Music Lessons in Real Time and Almost Real Time. Online learning has gained considerable acceptance in mainstream colleges; the challenges of teaching performance art are quite different. However, a number of universities have truly embraced in the technology. Berklee Online was the first non-profit music institution to offer regionally accredited bachelor's degrees online. The online school has been the recipient of University Professional and Continuing Education Association (UPCEA) awards from 2005-2015, including the Strategic Innovation in Online Education award in 2015. Students at Biola learn firsthand the rigors of musical composition and history, as well as the challenge of enhancing personal performance. They develop a sound Christian worldview taught by today's top thinkers and musicians while studying in the heart of Southern California - one of the world's leading music centers. Lynn offers world-class faculty and full-tuition scholarships to all enrolled conservatory students. MSM offers 450+ performances a year and shares its upper Manhattan neighborhood with Columbia University. MSM's faculty is made up of members of New York City's leading performing institutions. Our faculty come from the finest professional music organizations in the world. Our students come from the world over to study in fields which include music performance, music education and musicology We produce over 300 concerts and events annually on-campus in our three beautiful performance spaces-including world-renowned Moores Opera House. The distinguishing attributes of University of North Texas College of Music are the interactions of excellence, comprehensiveness, diversity, and professional development. For more than 125 years, the University of Southern California Thornton School of Music has prepared students to excel as performers, composers, industry leaders and educators on stages and in studios around the world. By blending the rigors of a traditional conservatory-style education with the benefits of a leading research university, USC Thornton offers a curriculum designed to prepare students for successful careers in the 21st century. The Yale School of Music educates and inspires students with exceptional artistic and academic talent for service to the profession and to society. To prepare students for roles as cultural leaders, the School engages fully with the University'sextraordinary intellectual and technological resources while collaborating with artistic centers throughout the world. Career development and wellness programs support all areas of student well-being. The Colburn Orchestra emulates a professional orchestra experience with distinguished guest conductors and Music Director Yehuda Gilad. Students perform alongside faculty and guest artists as part of the Colburn Chamber Music Society. All receive full-tuition scholarships, room and board. Curtis provides full-tuition scholarships to all of its students, ensuring that admissions are based on artistic promise alone. Enrollment is limited to the number of musicians needed for a symphony orchestra, opera department, and select programs in piano, guitar, composition, conducting, organ, and harpsichord. Committed to mentoring, The Royal Conservatory's Glenn Gould School keeps classes small and encourages supportive relationships with teachers. Additionally, it offers ample private lesson time, plentiful performance opportunities, and extensive master class programs. All classes and events take place in unparalleled facilities, including the internationally-acclaimed Koerner Hall. Hartt students have the opportunity to collaborate, often across disciplines. They work with guest artists, professional partnerships in training, complete internships, and have opportunities to perform around the world and alongside our esteemed faculty. With over 400 performances annually, Hartt is the largest producer of the performing arts in Connecticut. We promote talent in its holistic development-from the attainment of finest technical precision to being ready for the stage. As part of the music metropolis Berlin, and in direct cooperation with its cultural institutions, we impart upon our students the capacity to inspire a discerning audience. Since 1905 Juilliard educated the world's foremost musicians, then dancers & actors; it's Lincoln Center campus a launching ground for artistic achievement, with an equally world-renowned faculty. We see musicians as agents of change. We will enable you to decide for yourself what a meaningful life in music looks like, giving you the tools to make it a reality. The Meadows School of the Arts at Southern Methodist University (Dallas, Texas) offers conservatory-level music training with a high profile liberal arts education on a beautiful residential campus. Bachelor, Master, and Performer/Artist Diploma degrees are offered. Resources include the Dallas Symphony Orchestra and Dallas Opera. Scholarships are available. NEC is a premier conservatory that values exploration and collaboration. Students are mentored by a devoted faculty of esteemed artist-teachers and scholars. Alumni fill orchestra chairs, concert halls, jazz clubs, recording studios, and arts management positions worldwide. Stanislav Ioudenitch, 2001 Van Cliburn International Piano Competition winner, is artistic director; Behzod Abduraimov, 2009 London International Piano Competition winner, is artist-in-residence. Peabody Conservatory faculty foster an ethos of encouragement in their commitment to train top musicians. We think each student has his or her own unique musical gift to develop. Our proximity to New York City makes it possible to study with the most respected names in music and benefit from their real-world experience as performers, composers, and producers. With limited enrollment, you'll receive a great deal of personal attention and opportunities to perform right from the start. Situated in the cultural heart of one of the world's great musical cities, London's Royal College of Music has trained some of the most significant musical figures in history. RCM professors are world class musicians, who enable students to unlock their artistic potential in an unparalleled environment for inspiration. The San Francisco Conservatory of Music educates exceptionally talented musicians from around the world to become artists of the highest caliber, as well as musical citizens prepared for the challenges of the twenty-first century. Housed in one of the country's major universities, the Butler School provides students with opportunities unavailable to students in many smaller institutions. A dedicated faculty of artist-teachers, extraordinary performance opportunities, beautiful facilities and an unparalleled education at one of America's premiere universities.